Even small victories deserve celebrations. In that spirit my coworker-for-the-day, Jenna Freimuth, hit the play button and the sweet sounds of Harry Belafonte rolled out of the Bluetooth speaker on the shelf. Within seconds we were doing our own version of “shake, shake, shake senora” as his lyrics serenaded our celebration. It took an hour of work (and one YouTube tutorial), but we finally figured out how to master a serious design challenge that plagued me for months. Up until that point I’d either been too lazy, too busy or unable to access the right tools to get the job done. At the beginning of our workday, I had spouted off about how worried I was about an upcoming illustration project. I didn’t know how to move forward with this issue looming in my path. But like every other day I ignored the problem and moved onto something I thought felt more manageable. I would have gone on ignoring my problem, too, until Jenna whipped around in her rolling chair and demanded to see my laptop. Turns out she spent the last 20 minutes researching a solution to my problem and stumbled upon a breakthrough. I’m not used to the luxury of coworkers any more. I left my 9-to-5 job this past summer in lieu of a freelance career. The projects I work on range from writing and illustration, to events planning and art making. Sometimes I work from my studio or coffee shops, but oftentimes I find myself holed up in the front set of my car chipping away at a deadline. I love the flexibility of my lifestyle — even my movable, gas-guzzling office — but I miss swiveling around in my chair and sharing the daily moments with someone else. But today I got to pick my very own coworker-for-a-day. Hello, Jenna Freimuth — freelance illustrator and coffee drinking extraordinaire. We first met through that former 9-to-5 job when I commissioned her to draw a map of Minneapolis. We reconnected nearly two years later as I set off on my new career path, and that brought us to where we are today, shaking away to in her cozy at-home office to Harry Belafonte. We kicked off our first day co-working together at 9 a.m. In the corner of her office Jenna set up an adorable cardboard desk. Within the first five minutes we were testing out my new markers and trying to figure out the best drawing tool to layer white pattern over another color. Sometimes you just need another person in the room with you. 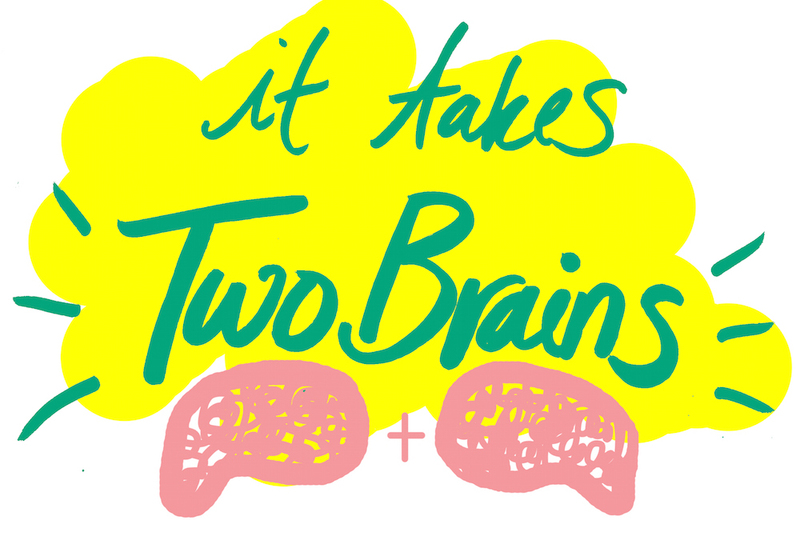 When it comes to getting a job done, two brains can be better than one. Every morning when I start working, I write out a list of goals I want to accomplish. Jenna and I both have work to get done. We’ve got clients waiting. But today offered me the opportunity for a bigger accomplishment outside of crossing off items from my to-do list. Today I had the chance to learn and grow from someone else’s presence and experience. There are two new illustration books sitting next to me for reference, Jenna showed me dozens of new Photoshop tutorials on Skillshare that will help me edit my illustrations better, and we geeked out over new supplies while sharing current work struggles. At the end of the day, this growth can be equally as important as the work you’re getting paid for. As a freelancer who works in creative spheres, I’ve learned that the personal work you make and share can often help you land paid clients down the line. It can feel selfish or financially unwise to make time for this work, but it’s actually an investment in yourself that can pay off. Spending the day working alongside a friend could sound like an excuse to take it easy for day. But the context you create your work in matters, and part of those physical surroundings include the people you put in it.